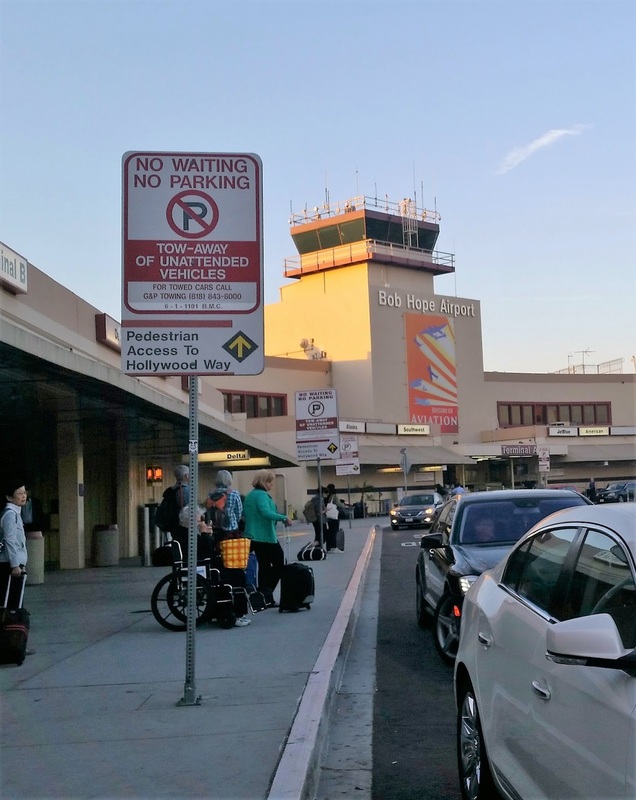 To celebrate our anniversary in early October, my husband and I felt the time was right to visit Los Angeles, just when authorities were warning of a potential earthquake, which, pardon the pun, was a little unsettling. You can read more about that issue here, Around that same time, flights were being canceled due to hurricanes--we always did have good timing. October is a dicey month to fly it seems. In the end, it all worked out, although we were delayed by an hour-and-a-half thanks to United Airlines. I'm still puzzled why that was. 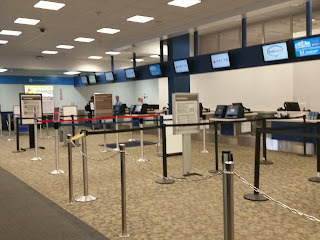 We ended up missing our connection and were forced to take the next flight out. Given all the extraneous circumstances, we felt lucky to have encountered just that one issue and our bags actually caught up with us! 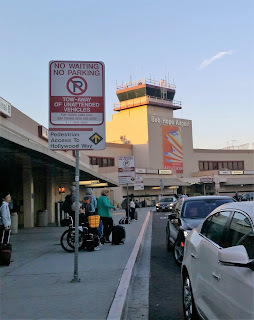 After landing at the smallest airport I've ever seen (the Bob Hope airport in Burbank) we were well on our way to an enjoyable time, although the walk to the rental car was a bit of a trek. 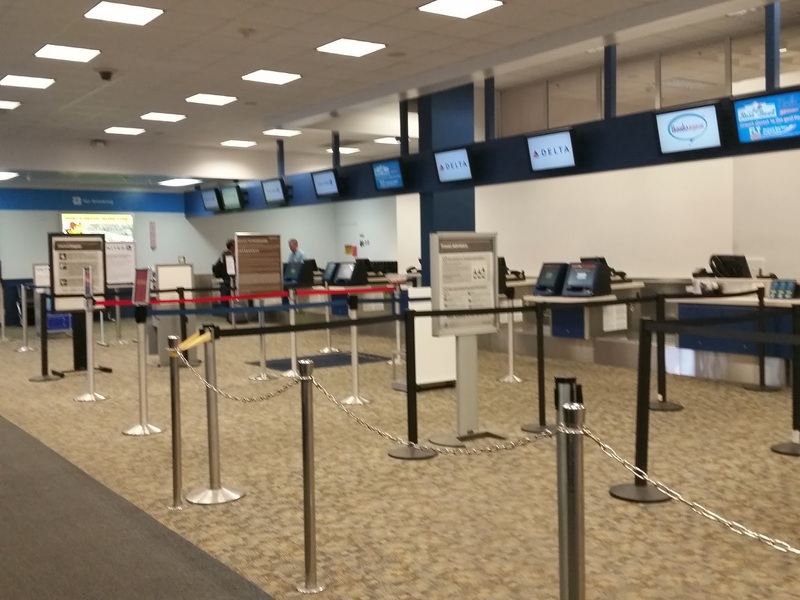 We learned that when an airport staffer said, "I hope you wore your hiking boots." I suppose it was still much shorter than any walk through LAX. During our visit we did the typical touristy stuff like visiting the La Brea Tarpits, the Hollywood Walk of Fame and Grauman's Chinese Theatre. The LA weather was wonderful with temps hovering in the low '80s the entire time, enabling us to enjoy a comfortable open-air van tour through Beverly Hills and Mulholland Drive. During the 1.5-hour trip, we learned a few details about the celebs and who owned what property. I now refer to the tour as the "Hedges of the Stars tour," although we did get a few clear shots of several that weren't blocked by walls, or greenery. (All these pictures and more will be soon posted on my Cheese Plates and Room Service Facebook page. You can view them by clicking here.) One interesting note: When we passed Drew Carey's house we noticed he had posted a Gary Johnson for President sign out front. 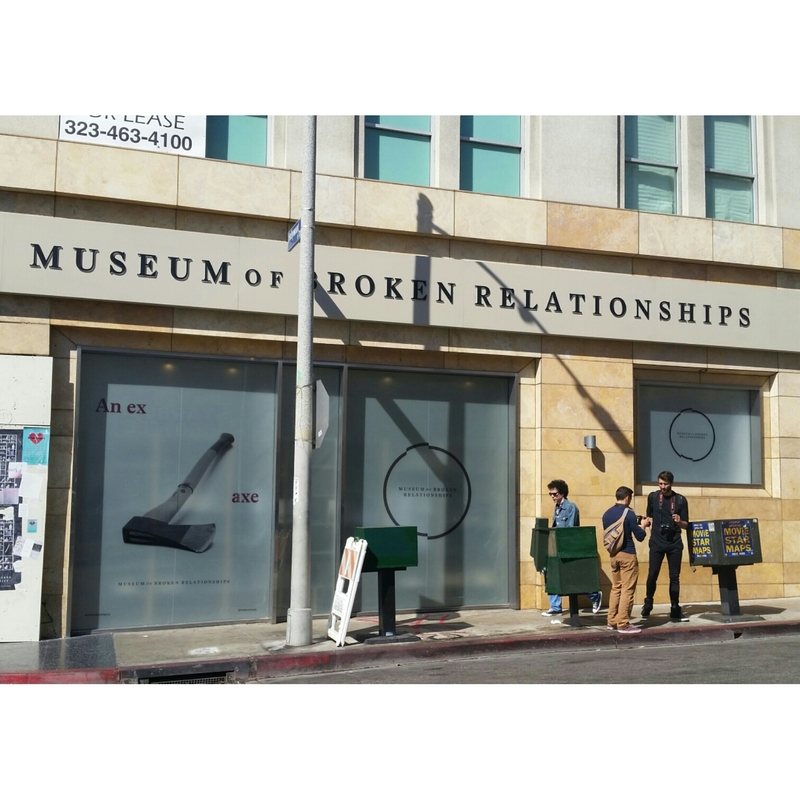 Our visit included more than one stroll down Hollywood Boulevard, where we stumbled on a rather plain building, but for the cryptic and stark sign plastered across the side, which read: Museum of Broken Relationships. Of course, I had to make it my business to return later for a closer look. Thinking I came upon a real find, I shared it with my North American Travel Journalist Association group and was informed that some of them had already visited the original location in Zagreb, Croatia--what a way to burst my bubble. Seriously though, the information was helpful in order to learn the launching point for the backstory. It turns out that the Hollywood location is the second incarnation of the original idea that had its roots in Croatia when two artists, in the midst of a breakup, pondered on what becomes of treasured objects after the dissolution of a relationship. After four years of touring, a permanent location opened in Zagreb in 2010 and just this year, the sad sediment of sentimentality opened in Hollywood--an apt location where dreams are both created and dashed. Donations come in from around the world and are gratefully accepted. The collection runs the gamut of items that were once meaningful to the possessors. Stories aren't just relegated to romance; they also include broken relationships with friends, drugs, once-cherished ideologies and more. These stories are laid bare within the protective walls of the museum, many sheltered behind plates of glass. Several rooms of artifacts, sent by anonymous donors are on display on both levels of the museum. Along with the tangible, are the tales of once was--from the wistful, to the sad, to the raging. A doodled-on mandolin, a shared love of Davida font and a monopoly game crafted by the hands of a loving husband as a 20th-anniversary present are just a few of the items on display. Just 18-months after the husband presented the board game to his wife, she informed him that she no longer loved him. With that, it ended. "I played my 'Get Out of Jail Free' card and I've been 'Advancing Past Go Ever Since,' he writes. A collection from a couple that loved Davida font. 103 love letters for each day the relationship lasted. One particularly sad story is that of a broken necklace accidentally ripped from her neck by an infant grandchild who later died a violent death. The story reads: "I cannot say that my heart was broken, a piece of it was torn away and crushed." Spiral-bound notebooks written in beautiful cursive and photographs span 76 years of family history. They were discovered by a landlord after eviction. My personal wish is that someone will share this and that someday the property will be returned to the rightful owner. Pages from a notebook documenting 76 years of family history is left behind following an eviction. I can't say the visit was the most uplifting time I've spent contemplating artifacts in a museum, but it does demonstrate that life goes on after relationships end. We can only hope that with the telling of the stories and the relinquishment of the reminders, that the donors will find the peace that comes with closure. Sadly this museum has since closed. Their Zagreb site is still open. 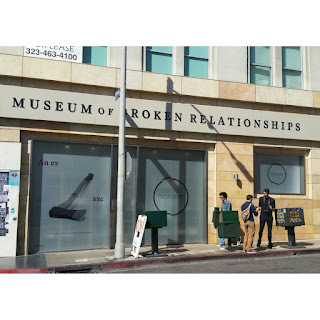 This is from the FB page of their site in Los Angeles: "After a successful year & a half at the center & heart of Hollywood, the Museum of Broken Relationships is looking for a new location which will permit it to offer a more dynamic and intimate experience." Keep an eye on their page for future details.